I just had windows installed at my house. I'm so satisfied with the hole experience from when Alex come to give me a quote straight though till Boris installed them. Everything was so professional! I was so inpress that I just ordered my front and side doors from them. I would highly recommend them. I had Windows by Installer replace some windows& doors in my house 2 1/2 years ago. This spring, I went to open the window of our rarely used guest bedroom. 10 minutes later, the window crashed onto the bedroom floor, with one of the glass panes breaking. The lower sash of the window pane was only secured by the lock, but if opened, the window was not held in by the stop or the casing. It is completely loose and falls inward. 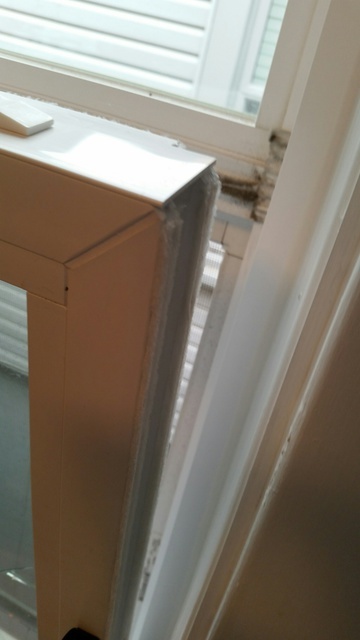 The upper portion of the window is secure, however the lower part of the window seems to be the wrong size or is missing components to keep it inside the casing. After contacting the Service Dept at Windows by Installer numerous times in the last 3 months, I have yet received an answer. If my call was answered, the reply was ' Let me review the file and I will call you back'. I never received a followup to my numerous calls or email. The customer service at this company is horrible, and I would never recommend them to install any windows or doors. We apologize for the issue that you had with your window. Kindly give us a call and provide us your address and phone number so that we can pull up your file, we will make sure we can service your window as soon as possible with no cost at all. We look forward to hear from you. Approximately 2 years ago we had Windows By Installer replace our patio door. Vadim was an excellent sales rep: very helpful and knowledgeable. After several delays from the company and our post on this site, we finally got them installed, only with the assistance of Vadim who stepped in to help us out. This past winter we decided to replace the rest of the windows. After a successful resolution to our last problem we decided to give Windows By Installer a second chance. Vadim was very helpful and friendly when he came out to discuss our options. We paid our deposit and were told it would be approximately 6 weeks before they would be ready to be installed. After an extensive delay in getting an installation date firmed, we had our windows installed about a month ago. While the delays in getting them installed were frustrating, the installation and final products are great. The installers arrived at the time that they had agreed to arrive at. They replaced all five windows in a timely manner. They cleaned up (most) of the mess, leaving some, including broken glass on a bed and the deck. Fortunately it was easily cleaned up by me after they left. This was disappointing compared to the excellent clean up that was done following the installation of our patio door by this same company, two years ago. The windows are great: They open so easily. There seems to be very little heat transfer on these hot days. We no longer hear cars going by in the front of the house and barely hear the trains at the back of the house. We are very pleased with the quality of the windows. I would certainly recommend that you deal with Vadim. He know his stuff. He will give you the best possible deal on the best product for you. If you run into any challenges with the other aspects of the company, he will be in your corner to make things right. At the end of the day: great windows; great price; great sales rep; excellent installation. Thanks again, Vad. On the day of installation, Broys and his team showed up on time and oh boy, they were amazing! We were blown away by their workmanship and efficiency. They are very pleasant to work with and I have to stress that, they are the cleanest contractors we have EVER have!! No damage to walls/floors, no debris were left behind. They took their time to make sure all windows are insulated/installed properly and cleaned up the job site afterward. We will definitely hire them again in a heartbeat and recommend them to friends and family if opportunity arise. Thumbs up! Great service. Installers were very helpful and very polite. On time and stayed late to make sure everything was perfect and i couldn't be more happy. These guys bust their asses to make sure everything is good instead of rushing to go home. They installed on a Friday night told me it would be done at 6 but stayed until 8:30pm on a Friday night and took their time to make sure I was happy. Price was very fair. Would definitely use this company again and have recommended to a few people as well. Installers cleaned everything when done left my house looking absolutely perfect and took old doors and trim in their truck to dispose off site. Signed and went over warranty and how to maintain and care for the door. Great guys. Only downside was my door took longer than expected to be made which pushed my installation date later which in all honesty is more their manufactuers fault but the sales associated helped me out price wise for the inconvenience and once installation date came the wait was worth it. Still deserves a 5 star ! After researching different companies to replace two windows that were not standard sized. We chose Alex Windows by Installer who had the type of product I wanted and the price was right. The experience with Alex was great and went smoothly. I placed a call to the Alex, described what I wanted, I got a quote and then scheduled Sergio (his brother) to come and take measurements. Soon after, I was informed when the item will be order and an approximate date they would receive it. Once we got past when the windows would be installed, the project continued smoothly. The guys Alex and Sergio showed up at the time they stated and installed the windows without any issues. They cleaned up after themselves and payment was promptly made upon completion. Thanks for the wonderful feedback. We had a great time working with you and we think the job turned out amazing. I'm happy to hear that you Kelly like our crew and the work that was performed for you. Thanks again for using our services and we would love to work with you again in the future. I went to the showroom to decide on 2 steel doors and 2 storm doors. Great selection!! I could not decide about color capping. I made a decision to go with white because windows had white capping. Alex also told me that because I was getting both doors at same time that I would be able to get one key for both doors. One key for front and back steel doors and one key for front and back storm doors. This will certainly make my life easier. Alex came on time, did a super job, both with installation and capping. He took ALL THE TRASH WITH HIM. I LOVE THE DOORS. The color,the glass,and the hardware.I am very happy I went back to Alex and his team. Thank you Alex and staff. It was a pleasure doing business with you.I will most definitely recommend you and if need be to call you in the future. Thank you Tony, I really appreciate for your support. It is our standard practice to always try to find a solution for all our customers in the most economical and practical way possible. I am glad you are happy with the solution we had provided for you. Thank You from all our Window Family ! If you want a capable windows installer at a reasonable price, I highly recommend "Windows by Installer". I just bought a house in King City, where I needed to replace 13 original windows from the 1960's. Alex came recommended from my contractor who had worked with Alex on other projects. I went a bit overboard in getting free estimates. I called at least a dozen companies. The owner Alex, came to my house, took measurements, and called me with the estimate the next day. He gave me a variety of window options and I was able to see the window in his showroom. He was the only guy who did not take up an hour of my time to oversell the quality of his windows. He was professional and answered all of my questions. The price was very close to the cheapest. I ultimately went with Alex . The installers were amazing. We had a 3 week old baby at the time and my wife was home alone during the install. My wife told me she could hear Alex instructing his guys to be quiet for the baby, which she appreciated and shows you the quality of the job. They cleaned up every day and there was not one speck of dust or dirt anywhere. We didn't even need to repaint the window trim, as there was no damage to the walls. We are very happy that we chose Windows by Installer and I highly recommend their workmanship. I have another window project coming up and they will be the only company I call. It's refreshing to have zero complaints with a contractor. The experience I had with Alex is the experience you should have with every contractor. Thank you for taking the time out of your busy schedule to give us a review. We are always willing to accept any input on how we provided our services. It is very important to us to take into consideration our customer's experience with us and we make it a rule to ensure our client's are 100% satisfied. Should you have any questions or concerns about your most recent window installation, please do not hesitate to contact us. Mario installed the door. It is good so far. Alex was prompt in communication, always replied to text. Omar followed up later to see if everything was fine. Happy with the door. Will recommend to anyone. We are so pleased that you're happy with our products and installation. We truly appreciate your kind words! Family Business, Home Office, No Sales people, No Middleman. You will save more than 60% on your project !!! I am a window installer. I have been working for one of the largest window companies for 22 years. I had many wonderful years being a part of a good and reliable company. My partner Mike and I, were the best installation team in the company, our main office always gave us the most difficult projects. We solve problems all the time. Windows were installed the right way, to make our clients and the main office happy at all times. However, for the last few years the economy has been struggling, especially for renovation companies. For the last two years I received less and less installation orders from my office. It was a hard time for me and my family. I have three wonderful kids and as a man of the household it is my job to support them financially. Mike and I decided to run our own business and do our own window installations. We get windows directly from the factory and install them for home owners like you. No extra expenses from your pocket ! Call me today and I will come to your place, I will give you an absolutely free consultation on how we can install new windows the right way and of course for the right price. If you become my client, you will receive all that you expect from any reputable window company. I will give you a lifetime warranty for windows and my labor. I am fully certified, I have all necessary licenses, certificates, insurance and WSIB. Call me and you will receive a full top of the line service, for a special price from Windows by Installer. I have been a window installer all my life, I love my job. I love my clients. I like to see smiling faces. Give me a call today 416-628-8008 and you will be happy! I always keep my word.